Synopsis: It has been six years since both Michael and Jamie disappeared from Haddonfield’s Police Station. Now, in 1995, the kids of Haddonfield want to have parties on Halloween Night again after their parents have banned it. The Strode family has moved into the Myers’ house, in an attempt to break the curse and to finally sell the house. Review: If you’ve made it this far in the saga of Michael Myers you’re pretty much open to anything…but wait until you’ve been cursed. The curse in question is participating in a viewing of this big ole turd of a sequel which is bottom of the barrel filmmaking at its very worst. 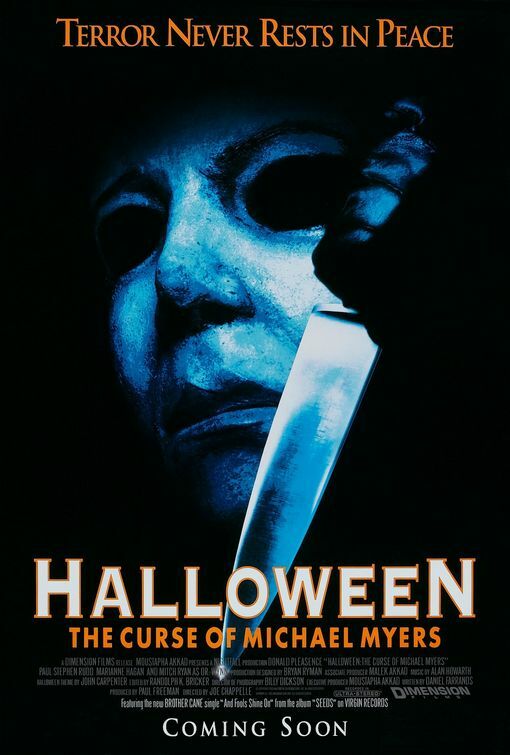 Nearly unwatchable, Halloween: The Curse of Michael Myers (which was originally marketed as Halloween 666) is just a nasty mess…as embarrassing to watch as I’m sure it was to make. Coming off of the mediocre success of Halloween 5: The Revenge of Michael Myers, the film picks up six years later with Myers niece Jamie giving birth to a baby boy in the bowels of some industrial building under the watch of a satanic cult that have kept her and her uncle hidden. It’s insinuated that Myers is the father of the baby but like much of the film, it’s never explained what the hell is really going on. At a brain killing 88 minutes, the movie follows Myers as he comes back to town and pursues a few hapless souls that can’t steer clear of various kitchen utensils used to maim and kill. To really describe the plot of the film would be to give away nearly everything and while I wouldn’t suggest the film to anyone I can’t bring myself to put major spoilers in my review no matter how wretched said film is. In short, the baby makes its way (incredibly) back to Haddonfield in the arms of Tommy Doyle. Halloween fans will remember Doyle as one of the children the Jamie Lee Curtis character was babysitting in John Carpenter’s original film…and that experience has made him one creepy and troubled dude. He’s played here by Rudd without a hint of the talent that we all know now Rudd has in spades. I’m not sure if Rudd was deliberately turning in a performance they could mock on Jimmy Fallon for eternity but that might be the only explanation to his cuckoo performance here. Try to choke back some tears when you see poor Pleasence literally giving his dying breath to a character he created decades before. Looking sickly and tired, Pleasence looks to be on the verge of keeling over as each frame of film passes by. What a way to go out – being forced to recite dreck dialogue and aide a movie studio in making money off of our misery. Pleasence would pass away before the movie saw the light of day…sparing him further embarrassment. Long in development and even longer on the shelf, Halloween: The Curse of Michael Myers is the lowest of the low and should never have seen the light of day. Frustratingly bone-headed, inexcusably made, and woefully lacking in any style or substance…the biggest nightmare you’ll face is knowing you’ve wasted precious time on it. Even worse…Halloween completists (like me!) will probably feel the need to watch this every now and then when they have a Michael Myers marathon. Pity.